Sat., Oct. 27, 2018, 4:44 p.m.
Robert Bowers, who authorities said attacked a Pittsburgh synagogue during Saturday morning services, appears to have targeted Jewish people on a social media account rife with anti-Semitic and white supremacist posts. An account under Bowers’ name on the social media site Gab, which is popular with white supremacists and other far-right figures who feel other platforms unfairly censor their views, was suspended Saturday shortly after the shooting. Messages posted on that Gab account, recovered before it was deactivated, specifically targeted the Hebrew Immigrant Aid Society, known as HIAS, which is one of nine organizations that works with the federal government to resettle refugees in American communities. “HIAS likes to bring invaders in that kill our people. I can’t sit by and watch my people get slaughtered. 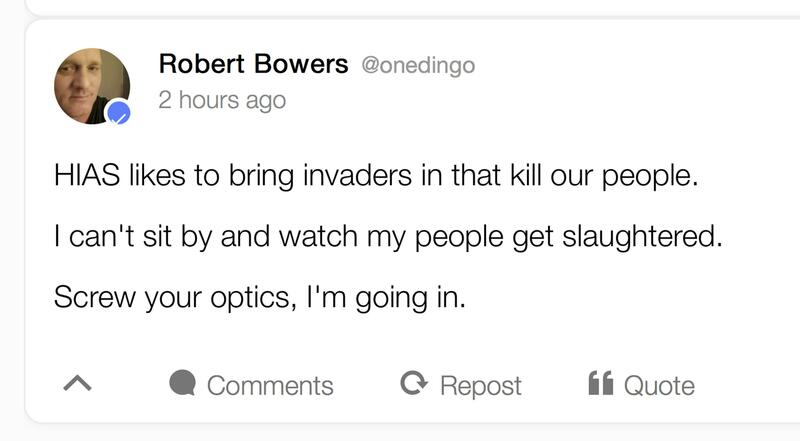 Screw your optics, I’m going in,” Bowers wrote hours before authorities said he opened fire at Tree of Life synagogue in Pittsburgh, killing at least 11 and wounding six. Bowers appears to have joined the site in January. His bio reads: “jews are the children of satan.” His background photo is a radar gun that reads “1488,” a popular white supremacist symbol. The account frequently reposted from others, including a cartoon referencing the phrase “zionist occupied government,” which white supremacists use to suggest that the government is controlled by Jewish people. In one posting, which seems to have been published several weeks ago, the author appears to threaten participants in the HIAS’s national refugee shabbat, in which more than 200 congregations across the country held celebration and worship services centered around refugees last week. Originally founded in 1881 to assist Jews fleeing Russia and Eastern Europe, the organization now works to resettle displaced people from around the world, including Muslim and Central and South American nations. “Why hello there HIAS! You like to bring in hostile invaders to dwell among us? We appreciate the list of friends you have provided,” the poster wrote before linking to the Web page that lists all of the participating congregations. Hetfield said he was attending a bar mitzvah in the District when his phone began buzzing in his pocket with dozens of calls and messages about the shooting and the suspect’s alleged posts about the HIAS. Hetfield said that the HIAS has helped many refugees resettled in Pittsburgh, placing 233 people in the region in 2016, and 122 in 2017, but managed just 42 placements this year after the Trump administration placed a historically low cap on the number of displaced people allowed to be resettled in the United States. Published: Oct. 27, 2018, 4:44 p.m.